The NWHL season has drawn to a close, the playoffs are finished and the Isobel Cup has a new home. It’s time to briefly reflect on each team’s performance over 2018-19. It took the Beauts a little while to find their form, and October and November brought just a .500 win percentage. December was better, and Buffalo went on a seven game winning streak. The Metropolitan Riveters upset the Beauts’ dreams of an undefeated 2019 in the final game of the season. Buffalo fought back from 3-2 down to force overtime, only to lose on penalties. That OT loss did give the team a valuable point which was the difference between playing the Rivs or the Boston Pride in the playoffs. Sure the Beauts scored a lot of goals (57) but they dominated on the blueline, allowing just 366 shots on goal compared to a league average of 448. The four shut-outs the team managed was also the most in the league. Buffalo players did very well at the NWHL awards; Shannon Szabados won Goaltender of the Year, Blake Bolden was Defender of the Year, Maddie Elia was the league’s MVP and Hayley Scamurra was the Players’ Top Player of the Year. The Beauts swerved a quarter-final game thanks to their second place finish in the league, so their first playoff game was the semi-final against the Boston Pride on March 9th. The Pride put up a good fight; half the game had passed before Buffalo’s Maddie Elia was able to break the deadlock. Emily Pfalzer added a powerplay goal, taking advantage of Kaleigh Fratkin’s cross-checking penalty. In the third period Emily Janiga added a third goal before Dani Cameranesi scored the Beauts’ fourth goal of the game. It was a career year for @HScamurra! 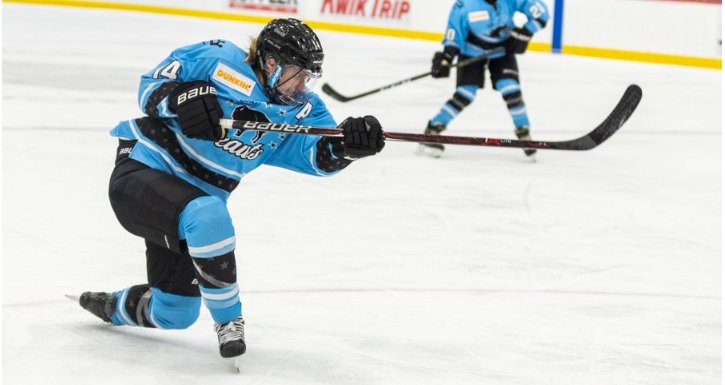 With the Pride shut-out, the Beauts advanced to the Isobel Cup final for the fourth time in as many seasons. We’ve already talked about how the final went down, and you can read about that here. What do you think of Buffalo’s performance this season? Comment below or join in the conversation on twitter!